A specially-built "bat hotel" is to be built in Cornwall. Four different species of bats, which are protected by law, were found on the 17-acre site of the former St Lawrence's Hospital in Bodmin. Work by the South West Regional Development Agency had started to transform the land into a business park, but now a bat consultant has been called in to make sure the mammals are not harmed. Space will now be made on the site for a special bat residence, which is being designed with the help of English Nature. Some rare species of bats were found in the underground tunnels of the old hospital. Robert McGuffie, the agency's regeneration manager, said: "Although we are looking at retaining some of the passageways, many will have to be filled in and most of the buildings will come down. "Because the bats are protected we are duty bound to rehouse them but with so many different species on site we're going to need something special because they all have different needs." Jane Squirrell, from English Nature, said: "We've discovered a breeding roost of about 30 lesser horseshoe bats. 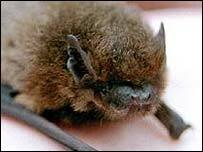 "These are rare bats in Britain, only found now in South West England and Wales. "We've also found pipistrelle, natterer's and brown long eared bats, and a survey with bat detectors indicates there could be other bats such as whiskered or Brandt's bats as well." The bat hotel will have separate areas for breeding, feeding and hibernation. Some bats like to stretch their wings indoors to warm up before going outside, so there will also be enough space to allow them to fly indoors.